This week we have drawn the Flower card. 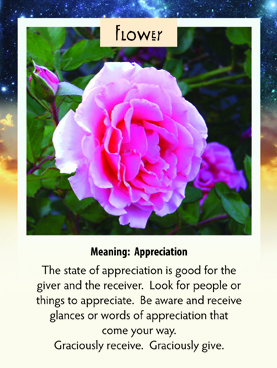 I love being directed to be in a state of Appreciation! That is our “homework” for this week. These are challenging times for most of us, even if not directly at least indirectly for things going on with our family and friends and with our global family. It is very easy to focus on what is wrong. So this week, every time you start to think about that, be it personal or global, stop yourself and think about something that you appreciate. It is a great exercise because when we settle on something of beauty or something or someone “good” in our lives, we just plain feel better on the spot. It works faster than any drug I have ever taken! Even if it doesn’t last, at least you have given your immune system AND the object of your appreciation a boost up instead of down. So keep after it all week and see what happens. The bigger the challenge you are facing the bigger this task…but also the bigger the opportunity to see how good you are at this! Practice makes perfect so keep on looking for the good things in your life…it is YOUR homework for this week! Ah if school had only been this much fun! The flower fields are blooming in Carlsbad–acres and acres of color, and a real celebration of spring. How nice to have this card join this display of beauty. It is beauty that can heal and move us forward out of the morass of depressing things happening. I won’t call them out. Just turn on the news. So what a joy to tune into chanel 10 and see the flower fields and also to have this beautiful card.